Do online shoppers move from awareness to purchase in a funnel, or do they pursue a nonlinear journey? At times, it feels like marketers, analysts, and the marketing community at large have been debating this issue more and more lately as the digital ecosystem grows more fragmented and more complex. Scott Brinker of the Chief Marketing Technologist blog recently had a great post discussing the buyer journey and the fact that consumers have never pursued a linear path to purchase. With the ever-expanding ways that consumers have to shop and purchase items online, it’s becoming more and more apparent that the concept of a funnel is an outmoded and outdated approach to thinking about how shoppers become buyers. 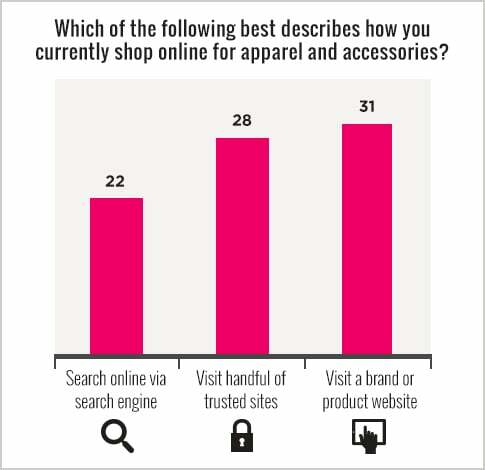 In our 2013 Holiday Shopping report, we asked women to focus on how they currently shop online for apparel and accessories and detail the process. Our results show that 31% of women typically visit brand or product websites first, 28% know exactly what they want and visit a handful of trusted sites, and 22% typically search online via a search engine to find what they need. A smaller percentage of women know exactly what they want and go to a single site (6%) or ask their friends for recommendations via social networks (2%). Women between the ages of 18 and 34 are more likely than women overall to visit brand and product websites first (38%) followed by visiting a handful of trusted sites (26%). Perhaps surprisingly, 18- to 34-year-old women were slightly less likely to seek advice from experts and influencers (7%) or from their friends via social media (1%). Women over the age of 35 ranked visiting a handful of trusted sites (32%) above visiting the brand or product websites first (23%). This suggests that marketing messages may perhaps play a larger role with younger audiences as they are potentially less likely to begin their holiday shopping process aware of the specific details of the products they are interested in purchasing and therefore are visiting brand and product sites to obtain those details. They also may be using comparison shopping and search as a means to obtain the best price for those products that are available at multiple stores. Messages that speak to key product differentiators or highlights may be successful at shortening their buying journey and move them closer to conversion. Women over the age of 35 appear to be more sure of the item they are seeking and are visiting a handful of trusted sites to help them complete the purchase. Marketers may want to focus on the benefits of the shopping process (free shipping, faster delivery) to help sway the consumer toward executing the purchase on their site. Next, we asked women to help us understand their “primary motivation” for shopping online; 34% of women cited the convenience, 25% felt that online offered better prices, and 17% mentioned the ability to find or use coupons. Then we asked women to detail what they currently disliked most about their online shopping experiences; 26% of women said that it takes too much time to find the perfect item, 25% disliked having to visit multiple sites to find the right product, 18% don’t know which sites to trust, and 17% feel that search engines don’t offer relevant results. Only 6% of women cited shipping costs as a current dislike. Finally, we asked them to craft their dream online apparel and accessories shopping experience; 73% of women indicated they want to be notified when the brands and products they love are for sale, 48% said that they want experiences that help them find everything they want in one place, and 40% want experiences that show them how to create a look by suggesting products that work well together, while 35% of women want suggestions on brands and products that suit their personal style. For retail marketers, these results indicate that women are interested in tailored experiences that offer personalization while reducing their need to visit multiple sites to complete their purchases. Retailers should realize that women don’t always have time to shop, so when they do, they appreciate retailers that offer customized or personalized content, targeted and dynamic email marketing, and tailored social messages combined with loyalty program benefits or coupons. They also don’t follow a linear path from brand awareness to consideration and purchase, so a combination of personalization combined with target advertising with strong creative messaging will be beneficial in order to help women discover their dream shopping experience and become more aware and ultimately more brand loyal.